Runners up included Fallout 4, Metal Gear Solid V, and The Witcher 3. At Tokyo Game Show, the Japan Game Awards takes the show to announce its own "Game of The Year" award winners. 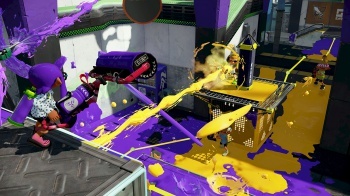 This year, Nintendo's Splatoon, despite releasing in May, 2015, won the over all game of the year for 2016. Runners up included Fallout 4, Metal Gear Solid V, and The Witcher 3. The "best sales" award went to Capcom's Monster Hunter Cross, which has sold over 3.3 million copies worldwide. Super Smash Bros. For Wii U And 3DS won the Global Award for a Japanese Product, and Call of Duty: Black Ops III won the Global Award for a Foreign product. Click here to check out the rest of our Tokyo Game Show 2016 coverage!